Wenzhou-Kean University is located in Li’ao, Ouhai District, Wenzhou City. Wenzhou is renowned as the hometown of a great number of overseas Chinese. The south-facing campus is a scenic spot fronting water surrounded on three sides by Chuitai Mountain. The Litang River flows through the campus from the west to the east. The campus covers 200 hectares in total. 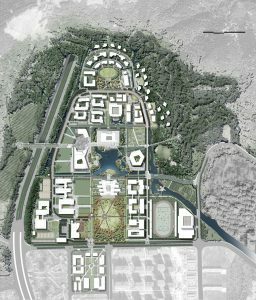 The first phase of the campus occupies 70.4 hectares, and its construction is planned to be around 250,000 square meters in total. 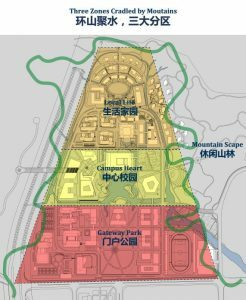 The university master plan integrates together Chinese and American planning principles, reflecting the cultures of both countries while matching up with the natural environment and climate conditions. 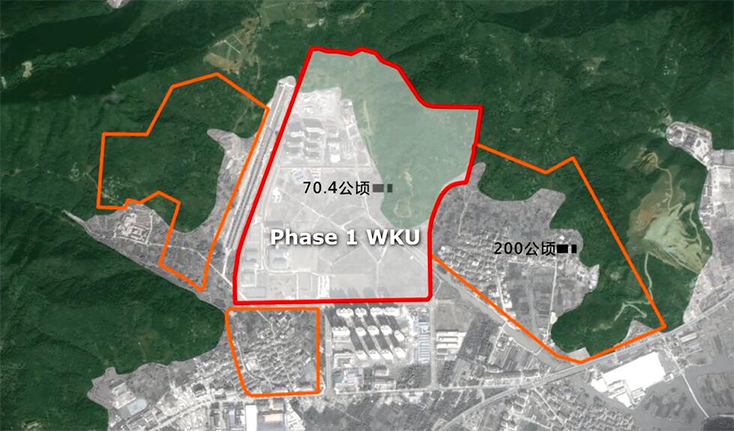 The phase 1 campus is planned as a whole. It’s designed as a pedestrian – friendly campus, where all circulation is for walking and cycling with provision for vehicular servicing and emergency access. The ecological concept of the sponge campus takes advantage of the prevalence of water in the area, and is introduced to blend campus, park and home in trinity. The campus embraces diversity and innovation. The buildings are designed by well – known international firms, reflecting different functions and demands with different elevations and styles, which is believed to inspire students’ innovative thinking and to encourage students to develop multiple points of view. Also, by configuring the buildings in from multiple points of view, a high level of variety is introduced to the campus experience. Many formal and informal public spaces are created. These include, for example, courtyards, a “Campo,” lawns, quadrangles, and the like, providing students with places other than academic buildings and dormitories for study and communication. As of March 2018, the General Education Hall, CBPM Building, Student Residential Halls, Training Apartment, Faculty Housings Phase 1, Athletics Center, No. 1 & No. 2 Dining Halls with approximately 122,500 square meters. Have been built. With these facilities and amenities in place, daily academic activities have been running well. 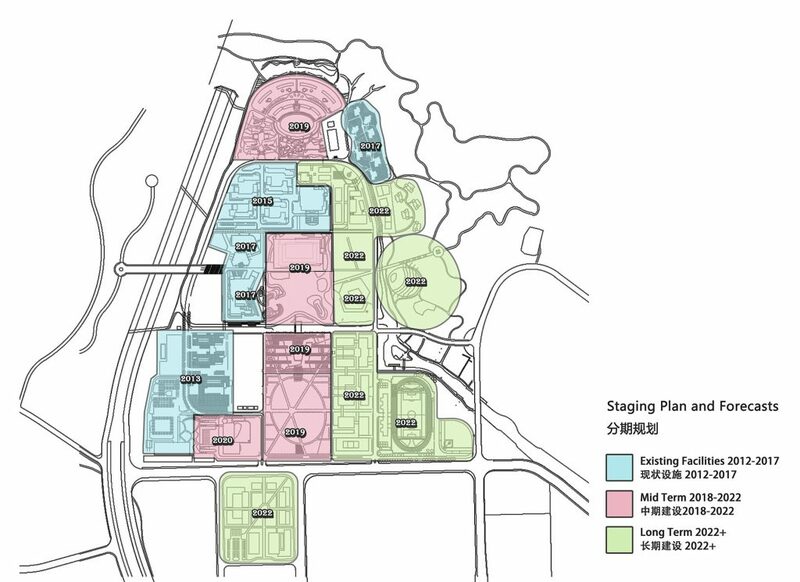 Additionally, GeHekai Hall (Architecture + Design Building) and the Student Dormitory Phase 2 have been under construction, projected to put into use in 2019. The construction for Student Learning and Activity Center, Life and Environmental Sciences building, Stadium, and Welcoming Center will be launched soon. The Phase 1 campus will be basically built before 2022 and the 133 hectares of Phase 2 campus will be designed in the near future.